Cologne is the undisputed Carnival king in Germany. Kölsch (beloved beer from Cologne) flows freely, children and adults adorn themselves in ridiculous costumes and the party takes to the streets. A Catholic holiday, all segments of the city celebrate Carnival in Cologne, Germany. 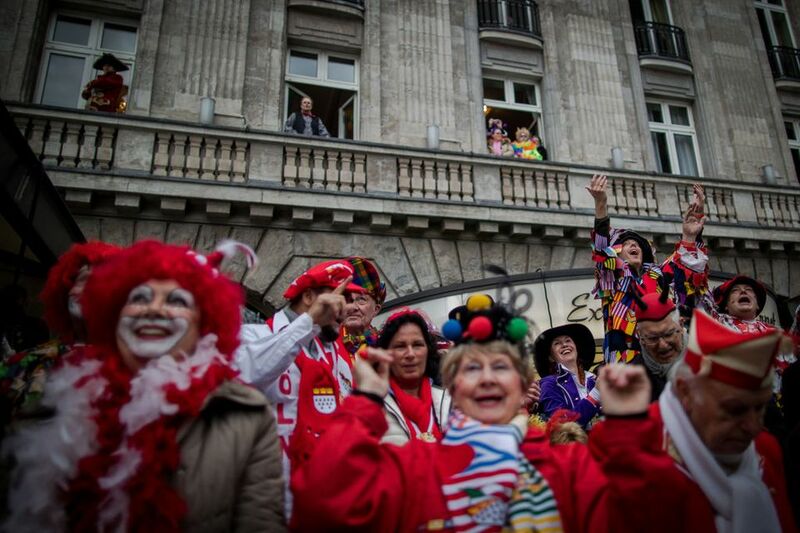 This celebration is called Karneval in Cologne. Carnival is the chance to get wild before going pious during Lent. It involves parades, costumes, and fancy evening balls. To participate, dress up as a jecke (clown - one of the most traditional costumes), drink some Glühwein or the beloved Cologne beer of Kölsch, eat a krapfen (doughnut), and join in on the lively events. Listen for cries of "Kölle Alaaf" from the crowds in Cologne - a rallying cheer. Carnival is not a national holiday in Germany, but in Cologne many shops, schools and offices will be closed (or close early) on Weiberfastnacht all the way through Rosenmontag and Veilchendienstag with the exception of Friday which is a regular workday. Even if shops are open, don't be surprised to find people in costume and a festival spirit throughout the city. Weiberfastnacht (the Women’s Carnival or "Fat Thursday" in other parts of the world) is held before Ash Wednesday and is a day for the ladies. Costumed women gather in the streets, gleefully attacking the men by cutting off their ties. For their compliance, men are rewarded with a bützchen (little kiss). People meet up at Alter Markt (or Alder Maat in the Kölsch dialect) by 11:11 a.m and three Carnival characters, the Prince, the Peasant and the Virgin, that will be featured in parade join the crowds. Much beer is drunk and merrymaking enjoyed. After the booze-filled afternoon, there are masked balls and parties in the evening. Carnival weekend carries on in its intoxicated manner under the valor of tradition. A Frühschoppen, an early-morning drink, is just one of these respected customs. Meet around 10:30 a.m. at Funkenbiwak in Neumarkt. By midday, the city of Cologne will be covered in jecke. Expect more formal balls in the evening. Rosenmontag (Rose Monday) takes places the following Monday and is a loud wake-up from the hangovers of the weekend. At 11:11 am, marching bands, dancers and floats strut down the streets, with performers tossing sweets known as kamelle and tulips to the boisterous crowds. In a show of pointed humor, floats often depict caricatures of politicians and famous German personalities. Veilchendienstag (Violet Tuesday or Shrove Tuesday) has things quieting down. There may be some parades and events in Cologne's suburbs, but the main event is the ceremonial burning of the nubbel (a life-size straw figure). This man-sized figure is strung up in front of many bars and just before Ash Wednesday he must pay the price for the people's sins by being burned. The largest ceremony in Cologne is in Kwartier Latäng, the student district. Aschermittwoch (Ash Wednesday) marks the end of a near-week of partying for Carnival in Cologne. Locals soothe their spirit with a visit to the church where they receive an ash cross to wear throughout the day and heal their tired bodies with a fish dinner. When is Carnival in Cologne? The carnival season in Germany (also called the "Fifth Season") officially begins months before the party. On November 11th, at 11:11 a.m the "Council of Eleven" gathers to plan the next year's events. Though planning is serious business, the air of playfulness can already be identified in the planners jaunty fool's caps complete with little bells. Many German cities host their own celebration, but few are on par with Cologne. Düsseldorf, Münster, Aachen and Mainz all feature large celebrations complete with grand street parades. Kids in places without a strong Carnival following (like the pagans in Berlin) are still able to participate. Even though the adults might not make a fuss, kids are commonly dressed in costume and have special celebrations at KiTa (preschool) or school. While Halloween is reserved for scary costumes (if celebrated at all), children can dress as anything they want for Carnival and many choose the costume of the festival, the Jecken. If you are completely left-out of the festivities, you can always watch the fun on German TV as multiple channels show the ceremony, parades, and festivities.